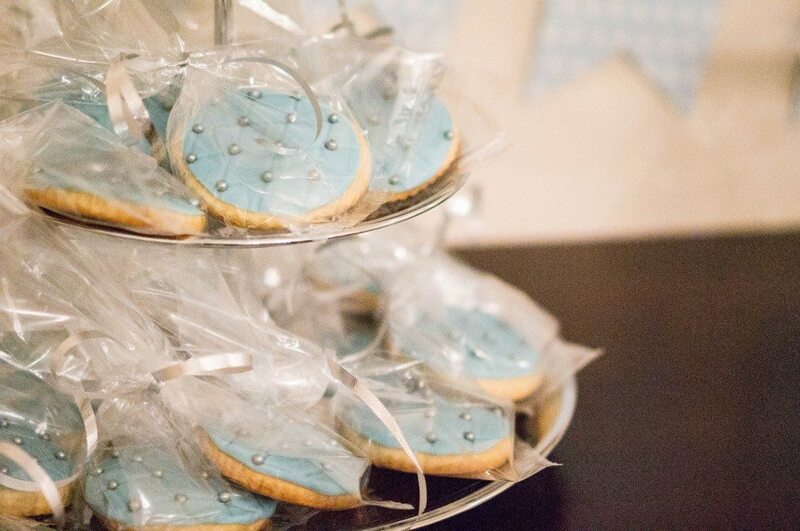 Today I’m going to walk you step-by-step on how I created these gorgeous and fancy sugar cookies for my son’s baptism. It really wasn’t that difficult to do. And I promise anyone can do it! 1. 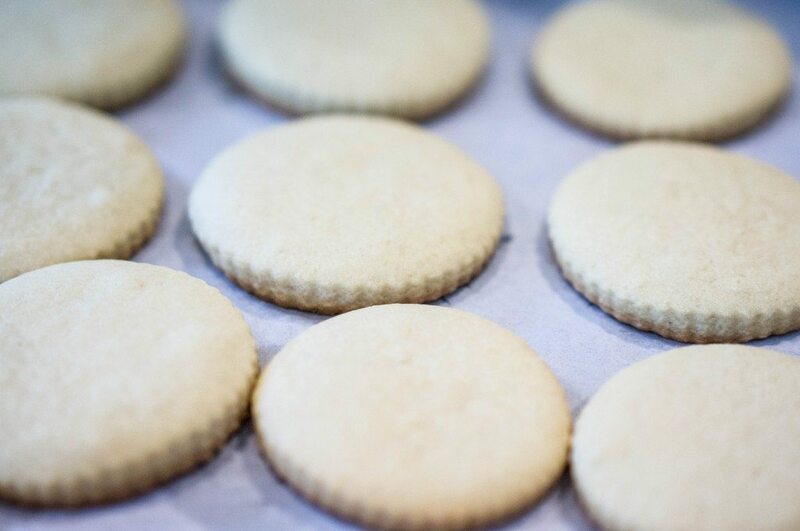 First, you need to bake a batch of sugar cookies. You can buy the pre-made dough or you can make your own. 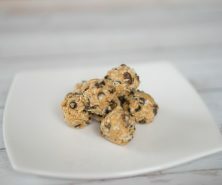 I baked mine from scratch using this Joy of Baking recipe. I like how she has videos with step-by-step instructions. 2. 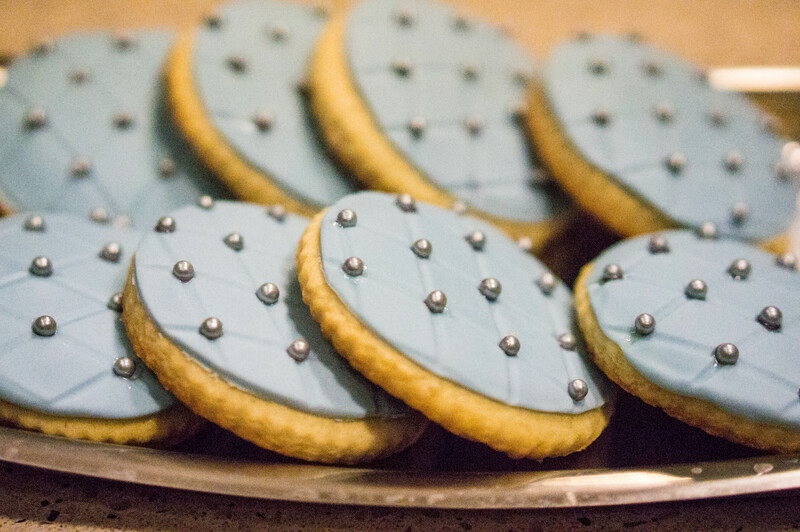 Once your cookies are cool, you can start working with your fondant to decorate them. I used a regular rolling pin, but you can also use a special fondant rolling pin (available at Michaels) for ease of use. Knead the fondant to make it smooth and then add a little bit of the icing colour to it (only a few dips with a toothpick). Add colour slowly as you can always make it darker if it’s too light. Use icing sugar or cornstarch if your fondant is sticking to the table. 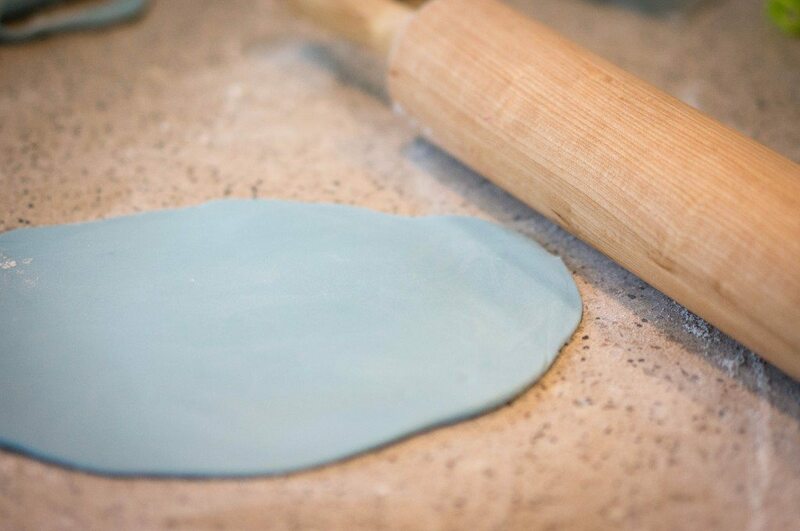 Then roll out your fondant to a thin consistency. 3. Cut out the fondant in your cookie shape. 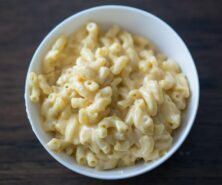 It doesn’t have to be round! If you did a star shaped cookie, use your cookie cutter to cut it out in a star. 4. 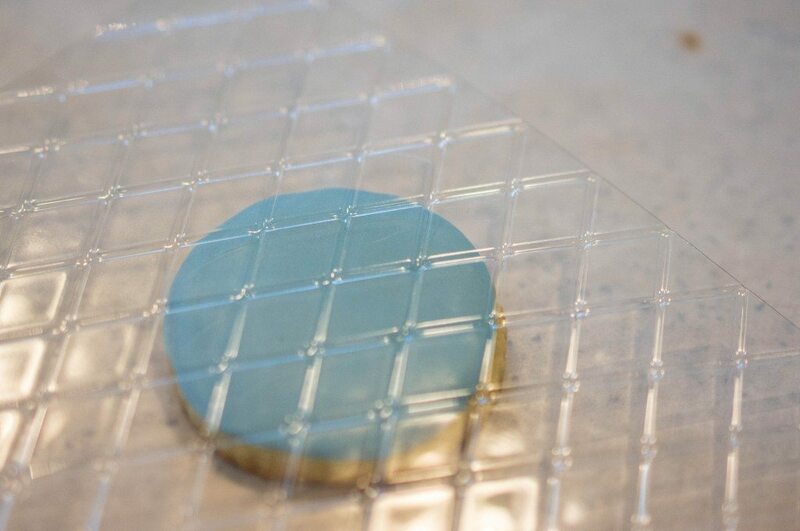 Place on your cookie and use your fondant smoother to smooth out the edges. 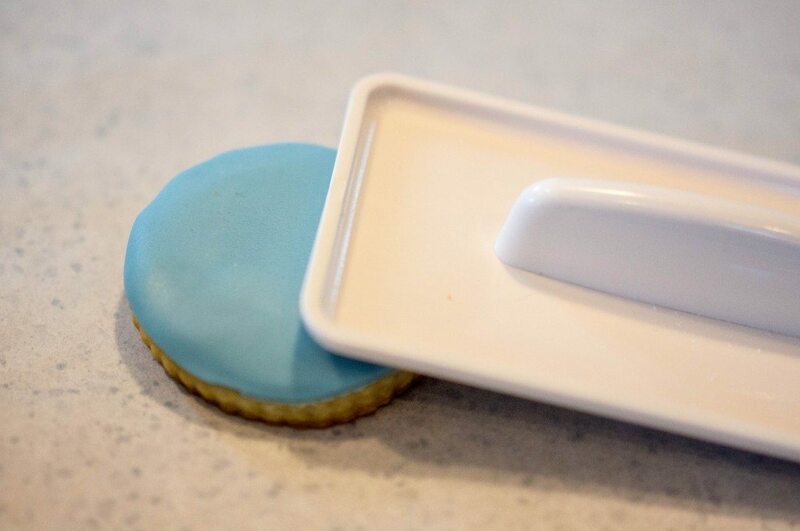 Before placing the fondant on the cookie, brush a bit of water on to help it stick. Then smooth out the fondant. 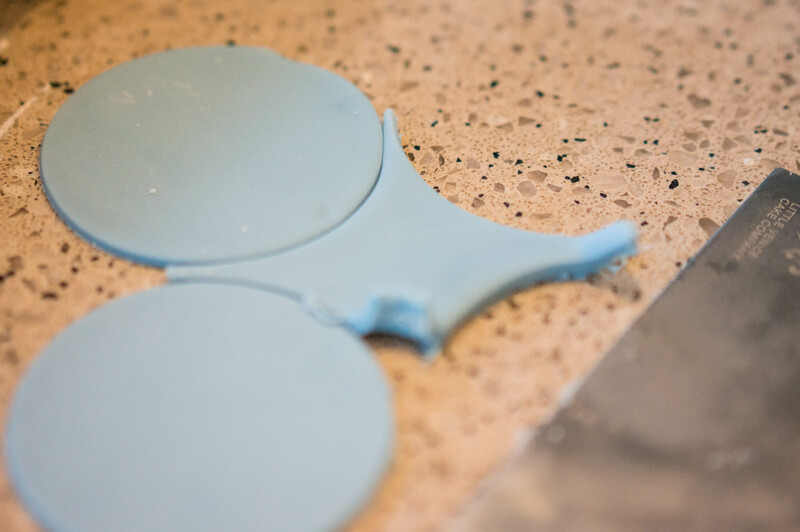 Note – if you don’t have a fondant smoother this step isn’t 100% necessary, you can smooth it with your fingers too. 5. 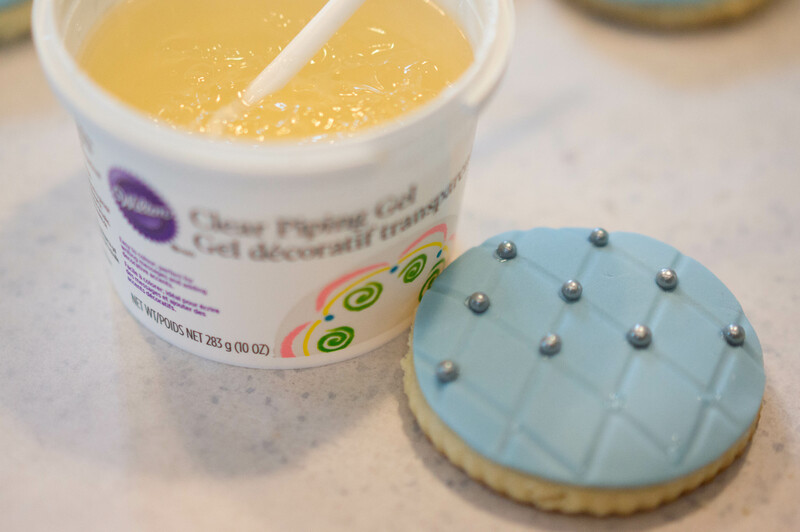 Using a quilted pattern imprint set (or a different imprint set of your choice) press into the cookie to make the pattern imprint on the fondant. 6. Then add piping gel to the intersections by dipping a little amount and putting on the cookie. Then add the beads. Set aside to dry. Here are the final cookies – wrap them in cellophane and add some ribbon to jazz them up a bit! I love how easy these look!! I’m definitely making them for Sophia’s first birthday! Oh glad you like them and they are super easy! Thanks for stopping by! Love this! I have always been baffled by those items in the cake section.. .now I know! 🙂 I will have to try to make some of these! So glad you like it! 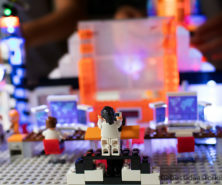 And post a picture to our Facebook group if you do! It was! Hope you try them!